The mobile-based auto inspection solution, ECO, will lead to car inspection app for inspections, verification, certification and valuation at a click by credited auto experts. 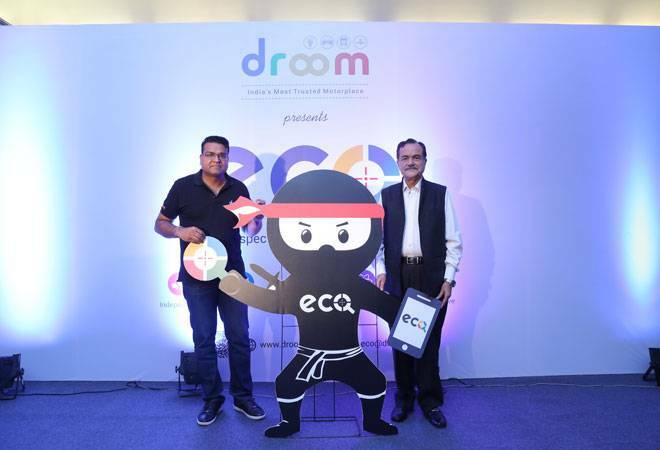 (L_R) Sandeep Agarwal, CEO and Founder, Droom and Jagdish Khattar, Managing Director, Carnation Auto with Eco Ninja at Eco App Launch. To boost buyer's confidence and bring transparency in used car buying, online automobile transactional platform Droom launched mobile-based auto inspection solutions with Jagdish Khattar-owned Carnation Auto on Tuesday. Droom's partnership with Carnation will also allow ECO users access to Carnation's extensive network of workshops and skilled technicians. Speaking on the launch, Jagdish Khattar, Managing Director, Carnation Auto said, "Used car sales continue to grow exponentially in India. The ECO app has the potential to reduce information asymmetry in pre-owned car transactions. Carnation being the leader in the car inspection space, will power all the Droom products across India. Together we will take selling and buying of used cars to the next level." Through the move, automobile technicians can leverage the ECO app to increase their consumer outreach and visibility. Equipped with a smart device, technical skills and the mobility to travel from one place to another, technicians can become ECO certified Ninjas through the tutorials on the app and make earnings of up to Rs 30,000 per month. Sandeep Agarwal, CEO and Founder, Droom, said, "Unlike US, Western Europe and Japan, India is a low-trust market in general and buyers for used automobiles suffer from information asymmetry and moral hazard. In India, buying a used vehicle was quite painful and loaded with hassles. It's now our commitment to increase trust and transparency for used automobile transactions in India with a comprehensive and scientific approach in inspection and verification service." Droom is a leading consumer internet company in India with over 41,000 sellers and more than 125,000 listings. The company has over a million downloads for its mobile apps.